India is an idea dying for.. whether u are Hindu or Muslim, an inhospitable graveyard at half the height of Everest, that was Kargil, the cream of a nation's youth reduced to a mass of blood, sorched flesh... and memories of valour. The story had to be told. 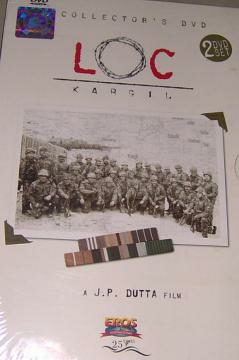 Before we forget... Kargil is not just a cold, isolated place. It is now an unforgettable landmark in our history. There is a timeless lesson in the story; a testament to the human spirit, the bravery of our officers and our jawans. This film is a tribute to their memories. A tribute to the bravest of the brave. What is astonishing and must be told, what is truly heroic about our boys is that they fought fairly. Yes, fairly. The enemy had already breached the rules of peace. If our Army, too, had crossed the L.O.C., they might have finished the war in 7 days flat. Our boys were angry, they were seething, but they showed tremendous restraint. They did not cross the L.O.C., no matter the provocation, the agony, the frustration of seeing their comrades dying around them. And so a 7-days war took 80 days to finish, took so many more lives than was actually necessary. Buy LOC Kargil (2005 2-Disc DVD Set), sold & shipped by Movie Time Video where you can shop online for Pooja Mandir, Bajot, Gifts, Hindi Movie DVD / CD, Music Video. This Hindi Movies collection has been tagged as IG5 3 RR 2.00 9.99 sam sunjay dutt ajay devgan suneil shetty saif ali khan.